For his first exhibition with T293, John Henderson will present a selection of works that consider and reconfigure the precedents of various art historical moments as well as the precedents of his own recent work. There is a self-conscious foundation to much of the work as it becomes clear that Henderson is not only shadowing art historical structures but also his own movements in the studio. The direct physicality of Henderson’s studio performances are refracted into muted objects and images that call into question or frame notions of authorship, originality and reproducibility. 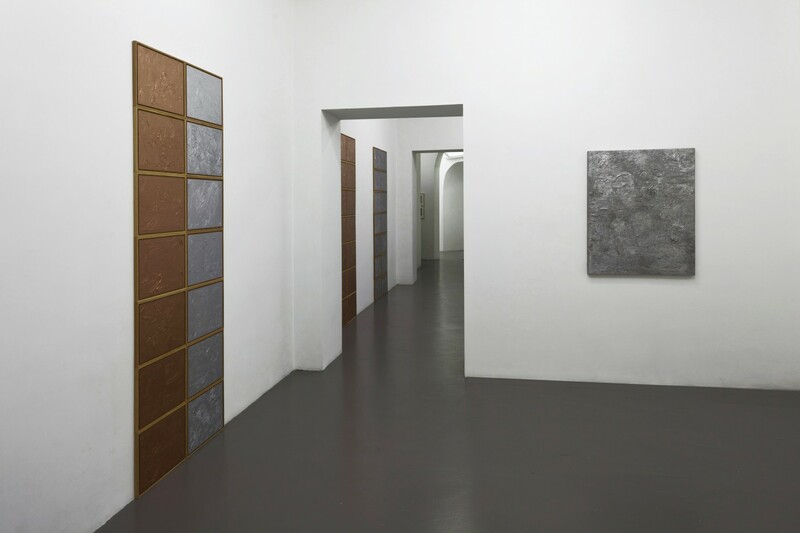 Included in the exhibition are works from an ongoing series of cast metal paintings. 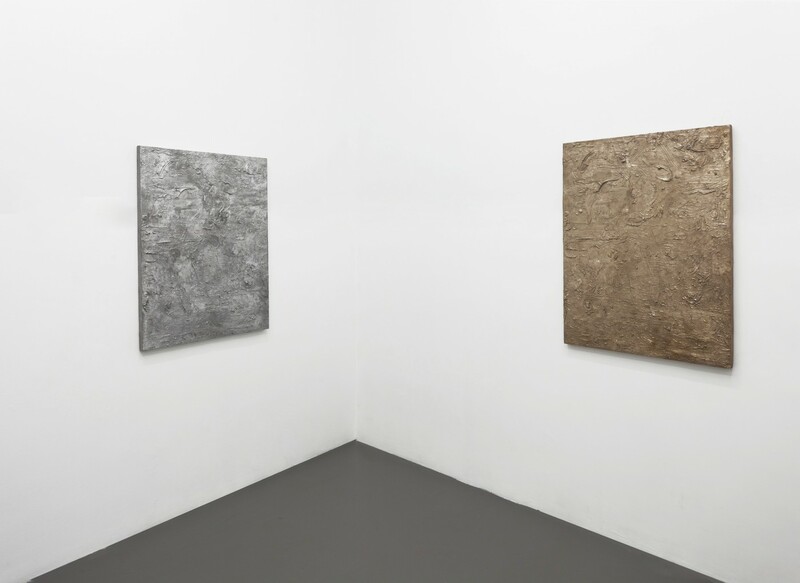 Using a lost-wax casting technique, sculptural surrogates of Henderson’s original paintings are created in bronze and aluminum. The original ‘mother’ paintings are destroyed and the cast replicas can be seen as a kind of documentation or leftover images. 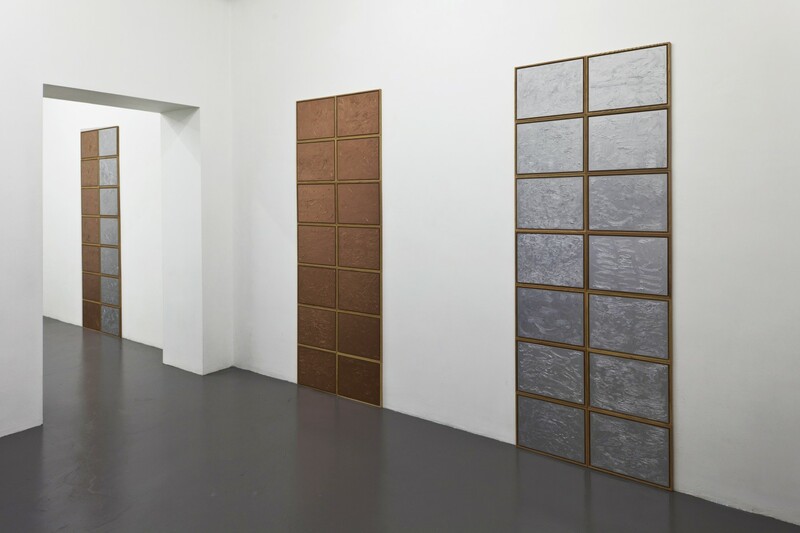 A new series of works also on view, entitled Recasts, are groups of painted panels, faux-finished to echo the metallic sheen of the casts, much like fake versions or knock-offs. 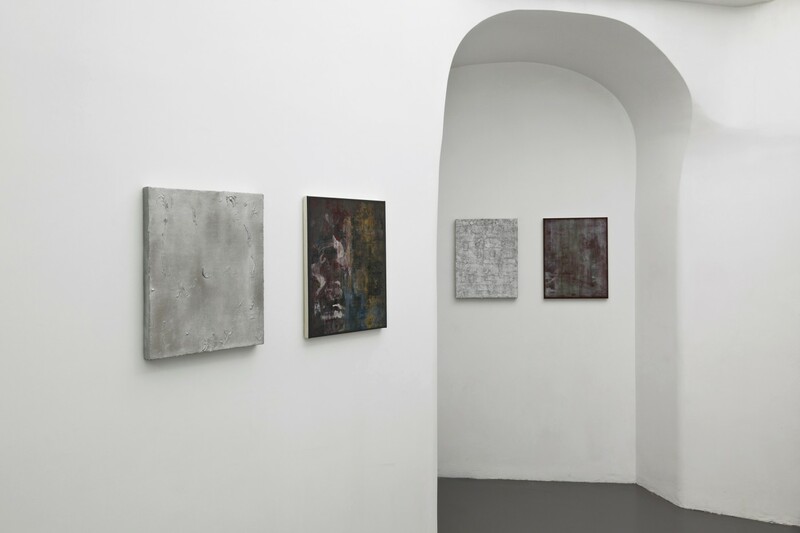 Hung in tight vertical grids, the individual paintings in these groups submit to a sculptural seriality, a minimalist regimentation that suggests that the unique qualities of each panel are flattened into a single field of expression. 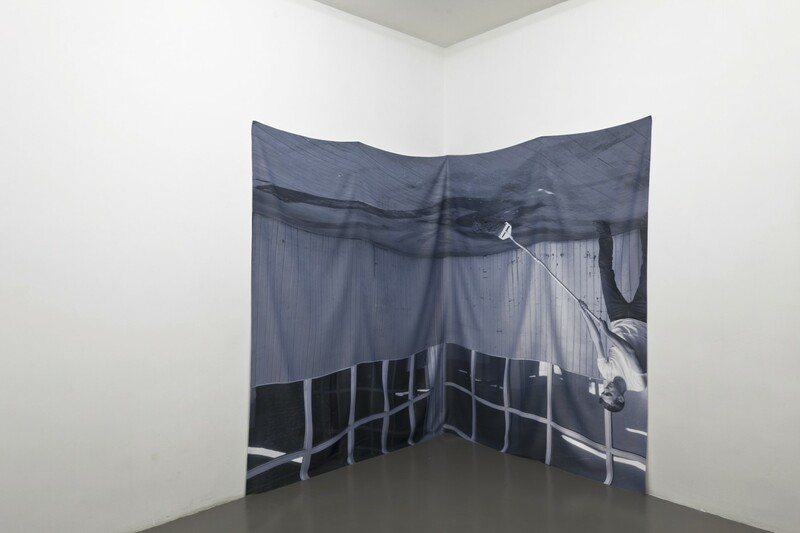 The largest work in the exhibition, Backdrop, Flipped and Cornered, is a fabric backdrop digitally printed with a photographic image inspired by Henderson’s video Cleanings, where the artist is featured mopping the floor in the corner of his studio. The image on the backdrop is not an actual still from the video, but rather a restaged likeness. 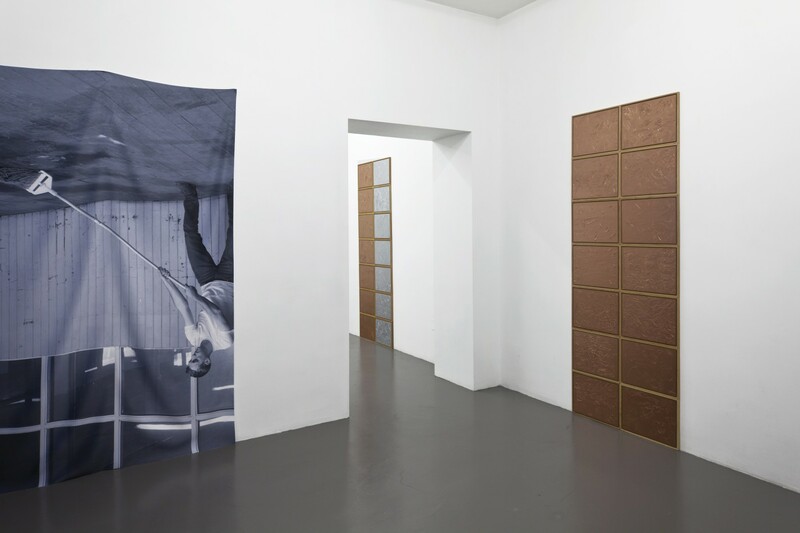 Henderson is again pictured mop in hand, except this time the orientation is off, the backdrop is hung upside down—the painterly action, grounded on the floor in the video, is now relegated to the ‘ceiling’. 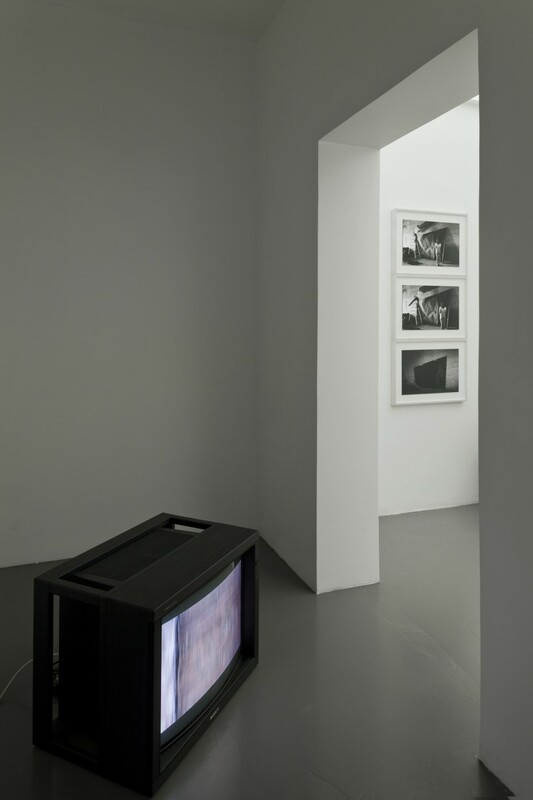 Two videos and a group of black-and-white photographs also approach the studio as a stage or backdrop where Henderson’s studio activities become performances reinterpreted through a critical lens. 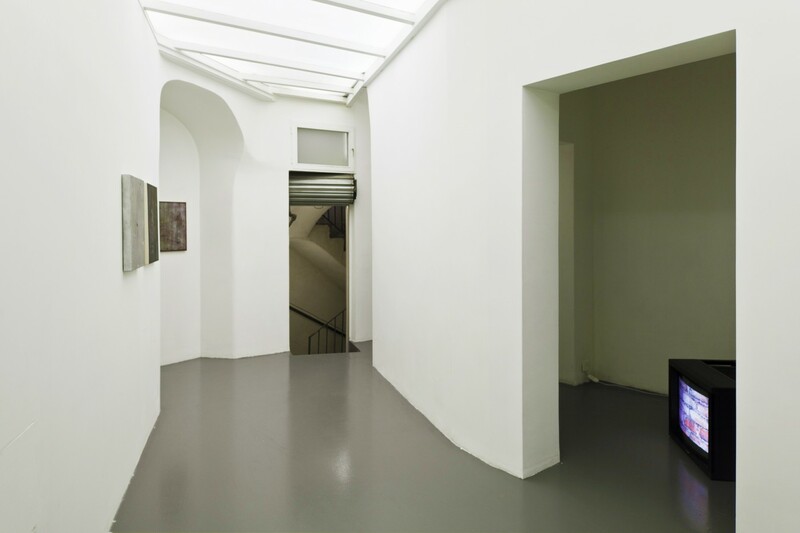 Throughout the exhibition – whether working through painting, sculpture, photography or video – Henderson positions himself at a point of retrospection, a position where each new expression is tied to another’s precedent.